With regards to the seven new candidates that I said or even eight, I see myself also if people come along with more commitment, I also step out. The knives are already sharpening in the corridors of power and this will indeed bring a loud cheer to those who aspires to ascend to No.2 when current NO.2 man in Sarawaks administration Alfred Jabu decides to call it a day from politics. The remark opens up another perspective that Mawan is considering taking up an offer to be a Full Minister in Najib’s administration if MCA still declines the position which is being held by Hishammudin. Could this a diversionary tactic by the SPDP strategists? G5 the SPDP separatists held secret meetings according to a political enforcer in view of the statement made public by Mawan. Its too obvious and they must be rubbing their hands in anticipation and even high fives each other. Certainly there will be more counter reactions and political statements which will see Sarawak being seen as in a tumultuous state. Its a concern but it will no doubt knock a ‘small dent” to CM Taibs plans. HOT !! Lets wait and there will be more JUICY ONES after The Hari Raya Celebrations. Interesting Development but which was Quashed immediately by the UMB SPDP is that the Director of Operations for Baram is YB Sylvester Entri of BN Club while Tiki Laffe of BN Club is contesting as Independant in Mas Gading. Baram candidate Anyi Ngau is heading the operations with his election team. The rumour is as malicious as it gets as this will disrupt the unity of SPDP going into the elections. Rumours also of Jelaing Mersat and Jacob Sagan (former deputy ministers and vice presidents of the party) standing was unfounded on nomination day. Now is not the time but the Sarawak Report article hit the “touch point” of the party where it is really timely, which has unified the party to go into the GE13 to win all 14 seats allocated. 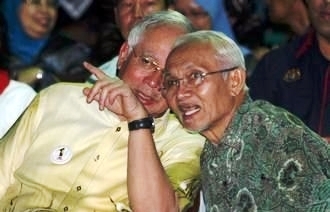 Moreover,the Federal and State relations where political watchers have said is SOURED received a morale-booster as PM Najib came out openly to quashed all rumours once an for all when Najib said he has full confidence in Taib running Sarawak as long as its in the BN interests. The Chap Goh Mei message to 10000 diners at MJC in Kuching Sarawak is an indicator that Najib has full confidence in Taibs leadership. This political endorsement from PM Najib has seen Taib criss crossing the State of Sarawak and delivering the message loud and clear “Janji di Tepati” to give BN and Najib the clearest mandate to lead the country. The SPDP Political secretary meanswhile said,’There are now no last minute candidate or helicoptered party candidate. We lost Ba’Kelalan to PKR by 400 over votes is because the candidate was a last minute choice and in this respect going into the GE we have 4 seats and when we are united we will win all the 4 seats. The party has stood solidly behind Barisan Nasional under the leadership of PM Najib and CM Taib eventhough we have lost 5 assemblyman and 1 MP. We have taken out the “traitors” and “enemies from within” the party and those loyalists will stand firm. Does that mean Anthony Nogeh and Tiong King Sing’s candidacy is finalised? Will the G5 group (BN Club) try to plant candidates and also go all out against SPDP? The Political Secretary said fine all being said and done but going into the GE13,” the BN Coalition of PBB,SUPP and PRS will stand solidly behind our candidates in the 4 areas and we likewise will have our members fighting together as one united BN against be it Pakatan group in PKR,DAP or PAS and also against the so-called BN friendly SWP or independant candidates. The G5 were sacked for insubordination against the party and the MP Tiki Laffe who is the incumbent for Mas Gading P192 will not be fielded and in place will be the party’s choice of Anthony Nogeh. As far as the party and grassroots are concerned he is the designated candidiate unless due to unforseen circumstances (you know… no need to mention) in place too will be a party CHOSEN candidate. On the plot to topple CM by certain quarters he said,”rumours,half-truths or fabrication can turn to be real and as usual we must remember this,”Sapa makan cili, dia la terasa pedas‘ (don’t play with fire,you might get burnt). We are solidly behind CM and CM knows what and how to handle the situation and we believe him. The unity and comradeship shown by the BN4 Sarawak should be commended as only when there is unity the BOND IS UNBREAKABLE. TAIB IS WALKING HIS TALK..
ARE YOU NOT DOING THE SAME…? In a telephone conversation to audie61 Capt.Zainuddin Tan Sri Hamden Sirat on behalf of SPDP and President Tan Sri William Mawan expressed his mosts sincere thanks to PBB directly through to SG Datuk Stephan Rundi in the light of recent comments from grassroot members and leaders in Mas Gading Parliamentary Area. They were enroute from Bintulu to Miri. Captain Zainuddin added we are united and we will work hard and ensure that the 4 SPDP seats remains with BN. On another note he as Chairman of Mambong SPDP said that the party is all out to ensure a resounding victory for PBB in the Mambong Constituency. We are with PBB all the way in Mambong and I’m sure all SPDP members will be with all BN component parties in the 31 Parliamentary seats. Capt.Zainuddin mentioned that all party members will be disciplined and if there are “traitors of BN” they will be disciplined by the party and referred to the disciplinary committee for immediate action. Those who still have doubts they better stand down says Captain Zainuddin. 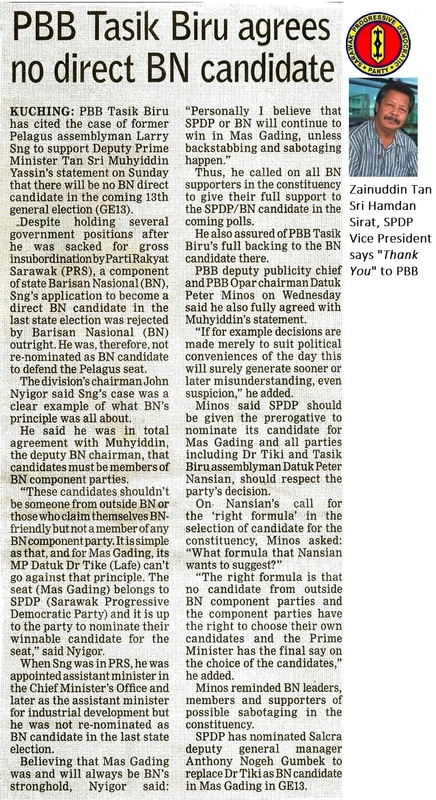 BN SARAWAK IS UNITED NO MATTER WHO OR WHAT PAKATAN RAKYAT SAYS…..
Our privelege source have mentioned to us the SPDP4 have issued a Press Statement today 6th January 2012. This is done on purpose to coincide with the Mas Gading Friends amongst Friends dinner on 7th January 2012 in CHMS Hall Lundu where the President William Mawan and his SC will be present. The Press Statement by the SPDP4 would be their resignation from the party and their disillusion with the party led by Party president William Mawan. However our source says that there are cornered and they are only using that as an excuse to leave the party. They also said that they do not want to get the CHILLS refering to the treatment suffered by their other YB Sylvester Entri. There are some technicalities involved in their want away from party in which we musts not delve too much but justs to tell them :-CHECK OUT THE PARTY CONSTITUTION AS YOU WERE VERY MUCH PART OF LOOKING THROUGH THE ARTICLES AND CLAUSES. YOUR ACTIONS MIGHT HAUNT YOU BACK.CHILLS…?? The word is out and spelt clearly,”I am a BN Direct member/YB” My position as Assistant Minister is the prerogative of the Chief Minister and nobody else besides the Chief Minister can drop me from his cabinet. 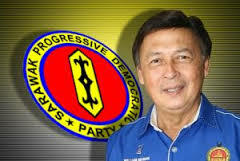 Sylvester Entri led branches from N66 Marudi out of SPDP(component of BN sarawak) and declared themselves BN members and supported PM Najib and CM Taib. This is indeed an unhealthy TREND and if it persists very soon we will have 3 other YBs plus an MP following suit. Political observers are commenting that it will also trickle down to SUPP after the election of office bearers on the 8th-11th December 2011. The YBs are already using this TREND which was very successfully used by Larry Sng during his tenure as Assistant Minister and YB for Pelagus N54. Tiki the current MP for Mas Gading would be using his influence on the PM that there were others before him in MP Billy Abit and MP James Dawos who all stood as BN direct candidates and won. He is at the moment according to reports from grassroots and leaders of component parties as an MP “who does nothing but is harmless and will win for BN” Even PCM Major Huan said Tiki is still “winnable” as SPDP is embroiled in infighting. A new face in Mas Gading be it Henry Jinep,Ik Pahon or others will need a lot of convincing for the voters. It will also open up an avenue for the opposition parties in DAP/PKR to put in a candidate capable of winniing it for Pakatan coalition. In the event of Tiki not being succesful to win a BN ticket to stand he will be a spoiler as he will still maintain he has blessings from BN but not SPDP. The BN/coalition would be hardpressed to answer this issue and gives more than a glimmer of hope to the Pakatan or independant candidates. N66 makes up the other half of Baram constituency and Deputy Minister Jacob sagan would also face a very delicate situation. This reminds me of the fight when PBDS candidates from different factions James Masing/Sng fought with Tajem/Salang. There were 6 seats which was bitterly fought over with one side using PBDS colours while the other being BN direct.We were dirrectly involved in the fight in Julau where the present deputy minister Joseph Salang took on PBDS wanita chief Josephine Mawat. This situation could arise here in the 4 seats of SPDP in MasGading,Saratok,Bintulu and Baram and proxies from the SPDP5 might justs be fielded to rock the boat. Could this justs be a winnable ploy for BN? After all its a Family matter and disagreements would be sorted out as soon after GE13. Its called BN MUST WIN at all costs. As for the other veteran or 5th to 6th term MPs who still sees that they have what it takes to wrestle and maintain the seats for BN its time for reconsideration. BN will not be justs facing the Pakatan but also dissatisfactions from the grassroots who are making enough noises to be heard. They need a new man and a new team to hlem their constituencies and will do whatever to derail the BN choices of overstayers. Pakatan are already vetting their candidates and they are putting in credible candidates as they have experienced now in running state adminstrations in Kelantan, Penang,Selangor,Kedah and a little while in Perak. They basically know they need to field the right people with the correct mindset. BN needs to look closely at “winnable” candidates too and the coalition should be ready to take a stand against those who are more of a liability to the BN chances of winning. BN has capitalised on Pakatans trojan horses and infighting and we are not surprised that Pakatan would capitalise on the issues of internal fighting within BN. When a house is divided the enemies would come in. Basically BN needs to put its houses in order and it is not only UMNO and PBB that represents the BN coalition. There are 10 or more parties/allies which holds the BN coalition. They need to be strong to fight the Pakatan parties who are building their voter base daily. There is no use to fool ourselves that BN will win handsomely. NO HARDWORK,NO PAIN THERE WILL BE NO GAIN. BN should not fool themselves and the earlier mosts of the issues are dealt with accordingly without covering up the loose ends the coalition will gain. If the strategists,politcal secretaries of the PM departments continue to give the false information on the ground swell to the top leaders the ‘defining battle” as Anwar puts it will be a reality. Hishammuddin the UMNO VP and Home Minister can’t wait for the battle to begin as he told us at audie61 but he knows also that BN musts be well prepared and all machinery musts be in tandem. PM Najib is careful not to take anything forgranted and that has been his nature and he will weigh up all options for the BN coalitions “winnable” candidates. He will timed the election date to BNs advantage and eventhough the opposition says its unfair there is nothing they can do about it. Surely,they will do the same if one day they are in power. Did not Selangor and Penang say they will not join the elections in November.Have they forgotten? The Ybs/MPs are the peoples representatives and they know what they want and are capable of doing. They will protect their positions at all costs and those aspiring ones will try to get a foothold on the seats which are within their reach. One Political analysts said it clearly,”Nothing Personal,It’s only Politics.We will continue to serve our master that looks after our rice bowls. Beyond that,REMEMBER AS YOU READING THIS one have to look elsewhere to maintain their needs and wants.” Will you not do the same.? “NEW TREND. ?”..YOU TELL ME..I AM LISTENING….